Mississippi Gov. 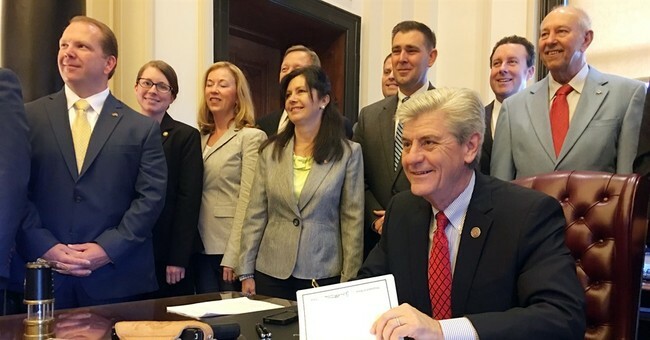 Phil Bryant (R) signed a law that bans abortion after 15 weeks gestation Monday, down from the current 20 week ban the state has in effect. This is the earliest any state has banned abortion and will likely face legal challenges. The law has exceptions for the life of the mother or if continuing the pregnancy would endanger a "major bodily function." The bill overwhelmingly passed the state legislature earlier this month, by a vote of 35-14 in the Senate and 76-34 in the House. Abortion groups have already threatened to sue, claiming the law is unconstitutional because it restricts abortion before viability. Mississippi’s only abortion clinic has promised to sue. URGENT ALERT: MS Gov. Phil Bryant just signed a 15-week abortion ban into law. This is part of a targeted attack on #RoevWade and a blatant attempt to chip away at women’s bodily autonomy and it WON'T STOP HERE.